I am a full-time graphic designer, mixed media artist and Certified Kaisen Muse Creativity Workshop Facilitator. I work primarily in collage, painting, and printmaking. I offer creativity and art workshops to individuals and companies to help ignite that creative spark. I want to help people think creatively to solve problems, to create art and to live an authentic creative life. I love experimentation and teach you how to let go of outcomes and remain open to new ideas, concepts and beliefs. I teach a variety of techniques that allow for spontaneity and play that help open the doors to those “aha” moments that make creating art so much fun. 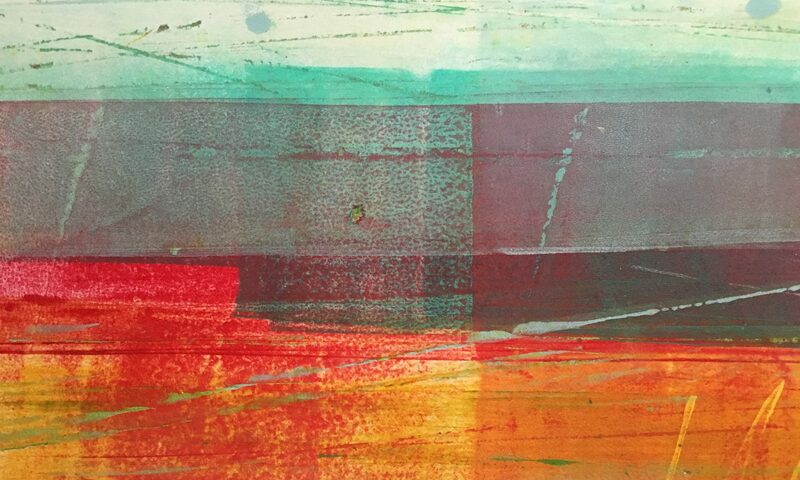 Discover a whole new world of artistic possibilities as we delve into the world of printing with gelatin printmaking techniques, block printing, stamp making, layers of color, patterns, and images to create richly textured works of art. This workshop focuses on spontaneity, experimentation and play. Discover how creative you really are. Learn techniques to ignite your creativity, imagination, and innovative thinking. Work through creative blocks and those ugly barriers that paralyze the creative process. You’ll find new sources of inspiration and work with collage, painting, printmaking and writing. This workshop teaches how to engage in the creative process, gain confidence with thinking creatively and develop creative thinking powers. Activities and techniques foster curiosity, brainstorming, exploration, and team work. What a great vibe there was. So many people. So much creativity. You gotta love it! For more information, please fill out and submit form below.